1200 New Hampshire Avenue is a freestanding, eight-story, 309,037 square foot (BOMA), Class A office building located in the CBD of Washington, DC. The building has frontage on M Street, Ward Place, and New Hampshire Avenue, permitting excellent vehicular access and making it a desirable law firm or corporate headquarters location. There are two below-grade levels of parking with 281 lined spaces. 1200 New Hampshire Avenue is part of the "Golden Triangle" Business District, equidistant from DuPont and Washington Circles. The building is also metro-accessible. The Foggy Bottom Metrorail station is 3 blocks, located at 22nd and Eye Streets on the Orange and Blue Metrorail lines and the DuPont Circle station is located three blocks northeast of the building on the Red line. 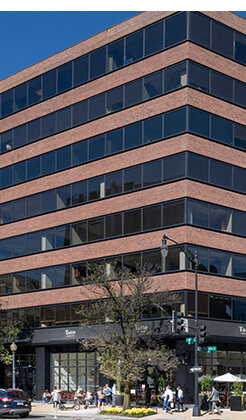 The building was built in 1979, renovated in 1995 and in 2011, the owners of 1200 New Hampshire Avenue took steps to enhance the appearance and amenities of the building. The exterior and lobby renovations include a 22-foot high glass facade, a two-story lobby with an expansive plaza entrance, a green roof, upgraded elevators and an expanded and fully renovated fitness facility. The goal was to update and reposition this 30-year old brick building while formalizing the outdoor space and maintaining the spacious-feel to the lobby. The recent lobby and façade renovation has brought a more modern and streamlined appearance to the building as a whole and further enhances the cache of the1200 New Hampshire Avenue address in the eyes of your clients and customers. The iconic entrance features include a new angled glass pavilion aligned to the sidewalk and a signature bronze wall that extends from the interior out to the building façade. The fitness center expansion and renovation houses state-of-the art work-out equipment with cable TV and updated locker rooms, each containing showers, lockers and restrooms. Click here to view additional 1200 New Hampshire Building Images. 1200 NH has achieved the Wired Certification with a Certification Status level of Gold.